Evergreen Yoga Center is a center for yoga and well-being in Midtown Memphis offering yoga classes and therapeutic massage. Whippet Creative developed their website to balance form and functionality with a relaxed and user friendly, modern design. 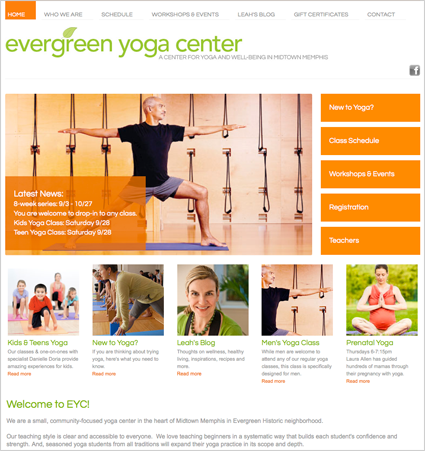 Evergreen Yoga Center' now has a mobile responsive website that engages the community with an online signup, latest news, and blog. Yoga classes, massage sessions and gift certificates can be purchased online. The website is fully manageable through a content management system allowing updates to class schedules, class descriptions, and photo galleries.